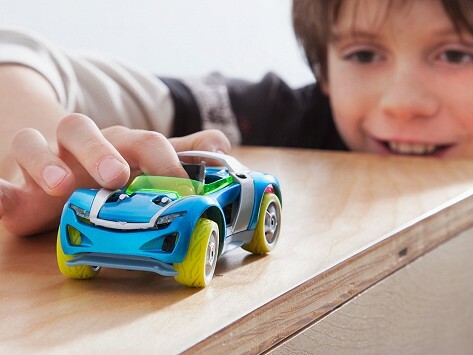 Modarri Cars are a new line of beautiful toy cars modeled after Italian supercars and designed to inspire creative, hands-on play. Drive them with your fingers and discover their real steering and suspension, soft grip tires, and EZ Grip body. Each car has a modular mix and match design allowing you to create 5 unique builds. Dimensions: Car: 5" x 3.5" x 1.5"; Box: 7.75" x 8.5" x 3.25"
Weight: Car: 0.22 lb. ; Box: 0.6 lb. All the positive reviews that I read prior to buying were exactly on the mark - great toys. Modarri cars are the ultimate toy car, built by three auto enthusiast dads with more than 60 years in the toy industry. They modeled Modarri after Italian supercars, with sleek design, working suspension, and responsive steering. Kids power, steer, and stop using a single finger, experiencing the real mechanics first hand. Durable and interchangeable, Modarri cars are easily taken apart and reconfigured. All of the parts can be mixed and matched between models. With the included hex tool, you can customize your ride into one of thousands of possible looks. Precision design and soft grip tires offer a tight turning radius. Make some figure eights or wheelies. Race against your friends. Then change up your car’s look. Makers David Silvergate and Brian Gulassa went all in on the debut product from their company, Thoughtfull Toys. The detail and deliberation they put into Modarri cars make them unique, stylish, and fun. These gorgeous cars are ones kids will love exploring and parents won’t mind having around.